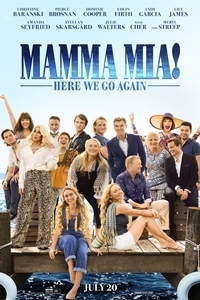 Synopsis: Ten years after Mamma Mia! The Movie, you are invited to return to the magical Greek island of Kalokairi in an all-new original musical based on the songs of ABBA. With the film's original cast returning and new additions including Lily James (Cinderella, Baby Driver). As the film goes back and forth in time to show how relationships forged in the past resonate in the present, James will play the role of Young Donna.